Will house prices start to come down across Canada? Canada’s housing market appears to be cooling across the board in the face of tighter mortgage rules that affect many first-time buyers of modest means, a new analysis from the Conference Board shows. The think-tank’s snapshot of resales for August shows a widespread decline in sales of existing homes, with 21 of 28 metropolitan markets registering a drop from July, and 16 of the markets showing a falloff of five per cent or more. As well, listings fell in 17 of the 28 markets, an indication that owners were reluctant to place their homes for sale due to soft conditions. Senior economist Robin Wiebe of the Conference Board said there was evidence of cooling in some markets — particularly Vancouver and Victoria — before the new rules went into effect July 9. But the new data shows the slowdown has spread to most markets and from coast to coast. At the time Finance Minister Jim Flaherty announced a maximum amortization period for mortgages would be reduced to 25 years from 30 years, the government estimated it would increase monthly payments by $184 on a $350,000 mortgage. It had been the fourth time Flaherty tightened mortgage requirements in four years, but the July measure was regarded as the one likely to be the most effective. While sales and prices were only temporarily sidetracked by the previous announcements, only to recover a few months later, this might “be the one that broke the camel’s back,” said Wiebe. Last week, the Canadian Real Estate Association reported that sales of existing homes fell 5.8% in August from July, and were down 8.9 per cent from August 2011. Still, the latest data shows that while sales and listings are down, prices appear to be holding steady. The report found prices fell in only nine of the 28 markets in August from the previous month. Compared to last August, prices were up in 25 markets. Economists have generally been forecasting a correction of between 10 and 25% in prices over the next two or three years. Vancouver, which had for years been Canada’s hottest market, has seen a tumble of about 30 per cent in resale homes. But Wiebe is not so sure the correction will be as severe as many predict, or that Vancouver’s market is as cold as the numbers suggest. He notes that Vancouver’s average home prices are skewed by the number of high-end properties sold — many to investors from China. Both the meteoric rise and current decline are “overstated,” he said. Homes in the Toronto area, Canada’s largest market, are also likely to retain their value, he said, because the economy in the city remains healthy and the greater metropolitan area continues to experience strong population growth. Is Vancouver becoming house rich but cash poor? Vancouver’s red hot housing market has taken on a distinctive fall chill, which has many would be buyers and sellers sitting on the fence right now. Christine Jassen and her partner are looking to cash in on their biggest asset by selling their 52-year-old ranch home on Vancouver’s tony west side for just over $1.9 million. But while last year this home would have likely seen multiple offers, it’s now been on the market for 130 days with no takers. It’s even had a price reduction. Realtor Lorne Goldman, who specializes in real estate on Vancouver’s west side, says he’s seen the price of some listings drop by 10 per cent recently. “I think buyers are hoping ‘the bubble’s going to burst, the bubble’s going to burst,” but you know, people have so much equity in their houses, it’s gone up so much, nobody’s really forced to sell,” he told CTV’s Steele on Your Side. But there are also lots of ‘house rich, cash poor’ residents in Metro Vancouver whose yearly property taxes have soared beyond their ability to pay – seniors on a fixed income who bought properties years ago before the prices skyrocketed. Blair Mantin, bankruptcy trustee at Sands & Associates, says seniors are the fastest growing segment of people he sees who are in financial trouble. He calls them the grandpa debtor: “We deal with people when they’re in a situation where they can no longer pay their bills and need to take some steps, whether that’s a payment plan, or to sign themselves into bankruptcy,” Mantin said. Seniors are less likely to be able to pay off debt because they can’t count on their income going up. “Once they’re on a fixed income it’s pretty tough to chisel away when you’re only able to make the minimum payments,” he said. Many homeowners in high-end neighbourhoods are looking for relief. This year, 31,291 B.C. residents over the age of 55 have registered to defer their property taxes. Of those cash-strapped homeowners, 3,000 are in the city of Vancouver. The Canadian Real Estate Association cut its 2012 and 2013 outlook for home sales and lowered its national average price forecast on Monday as it reported the biggest month-to-month drop in activity in two years. The association said that tighter regulations on mortgage lending that came into effect in July helped push August homes sales to their largest month-over-month decline since June 2010. Sales of previously owned Canadian houses and condos have now gone down in five of the past six months. “While we always caution that housing market trends at the national level can and do run counter to trends in many local markets, the decline in activity in August was definitely the result of much of the country moving in the same direction,” CREA president Wayne Moen said in a statement. Sales in August slipped 5.8% compared with July and were down 8.9% compared with August 2011. In its outlook for the year, CREA said Monday that home sales are now forecast to rise by 1.9% to 466,900 units in 2012. That compared with a forecast in June that suggested 475,800 homes would be sold in 2012, up 3.8% from 2011. CREA expects volume will slip by 1.9% to 457,800 units in 2013. CREA also forecast the national average home price would rise by just 0.6% to $365,000 in 2012 and edge lower by one tenth of one per cent to $364,500 in 2013. The outlook was down from a June forecast that prices would rise by 2.2% to $370,700 in 2012. TD has suggested that the tighter mortgage rules will shave five percentage points off sales activity and cut prices by three per cent on average during the second half of this year and early 2013. In the next three years, the bank has said it expects the combination of the tighter rules and anticipated modest increases in interest rates will result in a 10 per cent price correction on homes. CREA said sales were lower in about two-thirds of all local markets across Canada representing 80% of national activity, with lower monthly sales in almost all large urban centres, Toronto, Montreal, Vancouver, the Fraser Valley, Calgary, Edmonton and Ottawa. “The broadly based decline in August sales activity suggests that some buyers may no longer qualify for a mortgage now that amortization periods for high ratio mortgages have been shortened,”said Gregory Klump, CREA’s chief economist. Ottawa has tightened mortgage rules four times since 2008. Among the most recent changes, the federal government reduced the maximum amortization terms for government insured mortgages to 25 years from 30. The pace of housing starts picked up August, boosted by big multiple-unit projects in Toronto, even as the Canadian real estate market showed signs of cooling. Canada Mortgage and Housing Corp. said Tuesday there were 19,860 actual housing units started in August to set a seasonally adjusted annual pace of 224,900 units for the month, up from 208,000 in July. The consensus estimate by economists had been for a seasonally adjusted annual pace of 201,000. “This increase is primarily a reflection of the high level of pre-sales in some of these large multi-unit projects in late 2010 and early 2011, which is in line with job gains at that time,” said Mathieu Laberge, deputy chief economist at CMHC’s Market Analysis Centre. TD senior economist Jacques Marcil said the data shows Canadian housing construction remains in high gear and suggested the pace won’t continue. “The rest of the economy is growing much slower and as a consequence is not likely to be able to support this level of housing supply for much longer,” Marcil warned. Last week, Toronto Real Estate Board reported that sales of existing homes in the Toronto fell 12.5 per cent from last year, although the average price of $479,095 was 6.5 per cent higher. Meanwhile, the Vancouver board said sales dropped 30.7 per cent in August, while the average price was only 0.5 per cent lower at $609,500. The drop in sales followed a move by Finance Minister Jim Flaherty to reduce the amortization rate on new government insured mortgages to 25 years from 30. It was the fourth time in as many years the minister has tightened mortgage rules. CMHC said Tuesday that the seasonally adjusted annual rate of urban starts increased by 10.2 per cent to 205,900 units in August. Urban single starts remained relatively unchanged in August at 64,300 units, while multiple urban starts increased by 15.5 per cent to 141,600 units. August’s seasonally adjusted annual rate of urban starts increased by 47.5 per cent in Atlantic Canada, by 20.4 per cent in Ontario, by 18.2 per cent in British Columbia and by 1.3 per cent in the Prairies, while they dropped by 9.8 per cent in Quebec. This is one of the finest properties on Keats Island – an Irreplaceable Opportunity. Expansive water views South to Strait of Georgia, North to Howe Sound; this ten-acre property is privately situated on the third highest point of the island. Remote and romantic but with easy year-round access. You’ll never want to leave. The 2,600-square-foot house is built to the highest quality and newly updated with close to $250,000 spent on interior renovations by an award-winning design team. High-end finishes and appliances (Hansgrohe, Liebherr integrated fridge/wine cooler, Electrolux ovens), custom-designed kitchen cabinetry and numerous built-ins. Approx 1,200 sq.ft. of panoramic decks. 30 mins by boat from Horseshoe Bay. 1 mile by water from Gibsons. For further information, please see Keats Island real estate for sale. The Toronto and Vancouver housing markets have cooled rapidly in the wake of Ottawa’s latest bid to stop a bubble, with many first-time buyers knocked out of the running. Finance Minister Jim Flaherty put the July 9th changes into effect to curb growing mortgage debt levels and take some steam out of house prices. Among other things, the new rules cut the maximum length of insured mortgages to 25 years from 30. The changes have sparked a debate in Canada. Some industry players and economists worry that the impact will be so widespread and long-lasting that they want Mr. Flaherty to consider rolling some of them back. But with prices that some still deem overvalued and new fears over consumer debt, others say the changes aren’t enough and must be followed by a hike in rates. Among the latter is Toronto-Dominion Bank chief economist Craig Alexander, who estimates that national home prices are 10 to 15 per cent too high. He released a report last Thursday predicting the July changes will shave three percentage points off prices and five points off sales by next year. “Our models suggest that had the government not tightened lending mortgage rules between 2008 and 2011, the Canadian household debt-to-income ratio would have reached 160 per cent this year – the level that households in the U.S. and U.K reached before sending their economies and housing markets into a tailspin,” Mr. Alexander wrote. While debt burdens are lower than they would have been, they’re still at troubling levels. Moody’s Analytics said in a separate report that economic headwinds will increasingly cause consumers to struggle with their debt loads over the next few years. And although the mortgage insurance rule changes have curbed house sales and debt levels somewhat, the impact on prices has been relatively fleeting, Mr. Alexander said. Without rate increases, consumers still have a strong incentive to take out large mortgages, fuelling overvalued prices, he argues. The impact of the changes is predominantly being felt by first-time home buyers because they are typically the ones who require mortgage insurance. Insurance is mandatory in Canada for borrowers who have a down payment of less than 20 per cent, which has traditionally been about 35 to 40 per cent of the market. Brian Hurley, the CEO of Genworth Canada, the second-largest mortgage insurer, said business slowed in August as a result of the rule changes. He would like Ottawa to revisit the rules later this year, and consider reversing some of the changes. Eric Lascelles, chief economist at RBC Global Asset Management, approves of most of the rule changes, but said there is a risk that they are being overdone to compensate for ultra-low mortgage rates. “I wonder if the drop from 30 to 25 years amortization might be regretted in a decade when interest rates have normalized and 25-year-olds are being told they cannot make mortgage payments past the age of 50, even though they expect to work until 65,” he said in an e-mail. Traditionally, the banks have applied mortgage insurance rule changes to all mortgages – even those with large down payments that don’t require insurance. But that hasn’t been the case this time, Mr. Alexander said. Jim Murphy, the CEO of the Canadian Association of Accredited Mortgage Professionals, said that while Mr. Alexander’s prediction that the changes will dent sales by five percentage points could be correct, the impact on the insured portion of the market appears to be more like 15 per cent. “It’s having a bigger impact on first-time buyers,” he said. On Thursday, the Toronto Real Estate Board said sales of existing homes in the country’s most populous city fell almost 12.5 per cent in August from a year ago. But the average price rose by almost 6.5 per cent, to $479,095. One day earlier, Vancouver’s real estate board said August sales were the second-lowest level for that month since 1998, while the average price of a home in the Greater Vancouver Area was down 0.5 per cent from a year ago. TD Bank says tighter mortgage rules should do the job of cooling Canada’s hot housing market in the short term, but higher interest rates will be needed to return the market to saner levels. The bank’s chief economist Craig Alexander estimates the new rules, which went into effect July 9, will shave five percentage points off sales activity and cut prices by 3% on average during the second half of this year and early 2013. In the next three years, he expects the combination of the tighter rules and anticipated modest increases in interest rates will result in a 10% price correction on homes. While it is early, there are already tentative signs that the new rules have tempered sales, if not prices, especially in the country’s hottest markets — Toronto and Vancouver. The Toronto Real Estate Board reported Thursday that sales of existing homes in the greater municipal area fell 12.5% from last year, although the average price of $479,095 was 6.5% higher. Meanwhile, the Vancouver board said sales dropped 30.7% in August, while the average price was only 0.5% lower at $609,500. In July, Finance Minister Jim Flaherty reduced the amortization rate on new insured mortgages to 25 years from 30, bringing the maximum period for paying off a home back to the historic level. It was the fourth time Flaherty had tightened mortgage rules in as many years, incrementally dropping to amortization period from the high-water mark of 40 years. Alexander says the latest moves, which hike mortgage costs by $140 a month on the average priced home, may be even more effective than the previous efforts in slowing the market. But if the experience of the previous three moves are any guide, the slowdown will be temporary, lasting a few quarters, after which Canadians will dive back into the market. For a longer lasting solution to the overheated market, Alexander said Bank of Canada governor Mark Carney will need to hike interest rates to make borrowing more difficult and expensive. “Interest rates simply cannot stay at current levels indefinitely,” he says in the paper. On Wednesday, Carney kept the trendsetting policy rate at one%, marking two years that it has remained at the super-low level, and few economists expect him to act before mid-2013. Canadians have taken advantage of the cheap borrowing costs to buy homes, cottages, cars and other consumer items, but the result is that household debt has hit record levels at 152% of disposable income. Alexander says debt would even be higher if Ottawa hadn’t begun tightening mortgage rules in 2008. “Our models suggest that had the government not tightened mortgage rules between 2008 and 2011, the Canadian household debt-to-income ratio would have reached 160% this year,” he said. That’s about the level the U.S. and the United Kingdom reached before the collapse, although not all factors are similar. Alexander says he believes the latest rule changes would trim about one percentage point off credit growth. The average price of homes sold in B.C. is forecast to fall 7.8 per cent this year, but that doesn’t mean the price of a typical home will drop, the B.C. Real Estate Association’s chief economist Cameron Muir said Thursday. The average Multiple Listings Service price is down and will continue to fall because fewer single-family homes in tony neighbourhoods are selling, while more less-expensive homes are selling, Muir said, adding that there has been a noticeable lull in demand for single-family homes in Vancouver since January of this year. As well as calling for a drop in average prices, the BCREA’s third-quarter housing forecast calls for a drop of four per cent in the number of homes sold in B.C. this year offset by an increase of 7.5 per cent next year. “MLS residential prices are expected to remain relatively stable this year and through 2013, with changes in average price statistics largely the result of a differing mix of home types sold and shifting regional demand patterns,” Muir said, adding that the lull in demand is likely caused by some advance buying in 2011, poor job growth in 2011 and tighter mortgage regulations brought in by the government earlier this summer. The average MLS residential price in B.C. 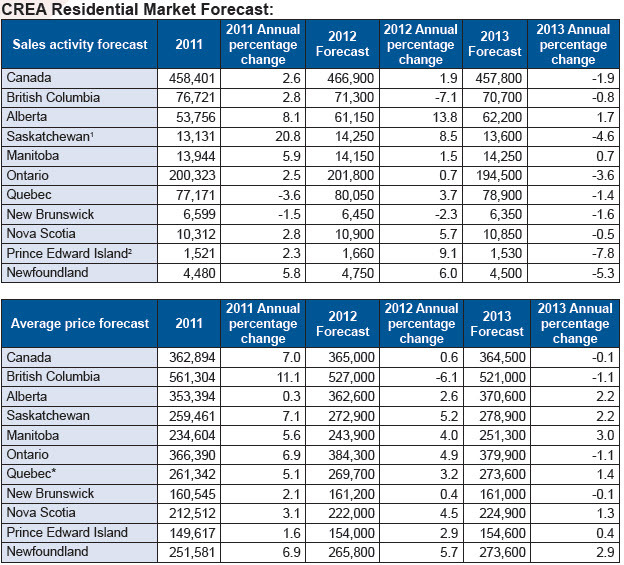 is forecast to drop 7.8 per cent to $517,500 this year, and remain relatively unchanged at $519,000 in 2013. The City of Vancouver issued $1.1 billion in building permits during the first six months of 2012, a 40-per-cent increase over 2011 and the first time in five years that construction has topped the billion-dollar figure for the first half of the year. “This adds to overall economic growth; it means more construction jobs and related spinoff jobs,” said Helmut Pastrick, chief economist at Central 1 Credit Union. Pastrick said the B.C. economy as a whole has not been performing as well in 2012 as it did in 2011 and the spike in construction activity the Vancouver building permit values represents, will provide a welcome boost to the economy. “It’s certainly a positive boost, Construction is one of the few sectors that is contributing to the economy in a positive way,” he said. The city said in a news release Thursday that residential, commercial, and industrial construction has gone through a “major rebound,” marking the first time since the 2008 recession that values have surpassed the billion-dollar mark. According to the city, construction activity added 6,000 new direct and spinoff jobs in Vancouver during the six-month period. Mayor Gregor Robertson said it is the first time construction values have exceeded pre-recession levels. The last time more than a billion dollars in permits was issued was the first half of 2007, when the figure hit $1.58 billion. Adrien Byrne, communications manager for the Urban Development Institute said the spike in permits show that the construction sector in Vancouver is healthy. It should translate into better prices for condominium units. “Basically, there is a lot of supply coming on in the market. It shows a healthy market,” he said. Byrne said the UDI is working closely with the city to reduce red-tape and planning hurdles. Key developments that contributed to the 2012 increase include a 22-storey residential building at 999 Seymour valued at $24.2 million and the 36-storey MNP Tower at 1021 West Hastings valued at $75 million. “These numbers reflect the importance to the economy and to job creation that the development industry has. What we need is for these kind of numbers to continue,” Byrne said. Commercial and industrial construction have also rebounded. During the first six months of the year, permits were issued for more than one million square feet of non-residential space, up dramatically from the 160,000 square feet that was permitted during the first six months of 2011.